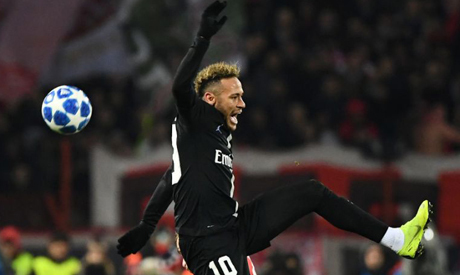 Neymar is doubtful for next month's Champions League clash against Manchester United after Paris St Germain confirmed the forward has injured a metatarsal in his right foot during their 2-0 French Cup win over Strasbourg on Wednesday. Neymar, 26, left the pitch after twisting his foot and the club said initial examinations revealed a "reactivation of the lesion of the fifth right metatarsal", adding that treatment would depend on how the injury heals in the next few days. "Neymar is worried, because it's the same foot, the right foot, in the same area," PSG manager Thomas Tuchel told reporters. Tuchel criticised the referee for not protecting the Brazilian when Strasbourg's players repeatedly fouled him. "The referee didn't whistle on one occasion, then two, then three and after that he ended up twisting his foot," he added.